High quality programmable DC power supply with a two scale output (+16 V / 10 A or +32 V / 5 A, max 160 W). Delivery including USB cable, power adapter, microfuses and manual (on CD). The Rigol DP1116A is a very high quality programmable laboratory power supply with a switchable output up to 16 V / 10 A or 32 V / 5 A and a maximum power output of 160 W.
Like all Rigol devices, the laboratory power supply features a very well thought out and easy to use interface which also offers comprehensive ease-of-use functions such as programmable voltage curves. The menu follows an easy to navigate and intuitive structure. 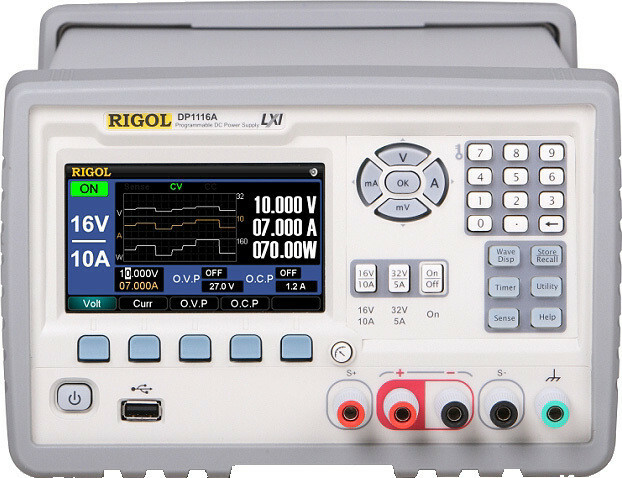 For a laboratory power supply, the Rigol DP1116A features a particularly large (10.9 cm / 4.3") and easy to read TFT color display. In addition to the normal digital displays for voltage, current, and power, these values can also be displayed as signal curves. A timer control can be used to set the output signal to different values in up to 100 steps. All important data such as voltage, current, power, and limit values can easily be displayed on the extra large display with a diagonal size of 10.9 cm (4.3") and a resolution of 480x272 pixels. As an alternative to the normal measured value display, the settings and measured values can also be displayed in an easy to read “analog” form. All settings can easily be stored in internal memory or on a USB stick. This allows time-consuming settings (such as timer programs) to be saved for later use. The sense inputs of the Rigol DP1116A can be used to compensate for voltage drops across connecting lines. This is particularly important for high current values since the output resistance plays a larger role in this case. As you have come to expect from Rigol, online help is also available for this laboratory power supply and provides useful information about the individual device functions. The Rigol DP1116A can be controlled remotely with SCPI commands through a variety of interfaces. Control of the device can be integrated in your own programs or in LabView via these interfaces. no software available, but interfacing with other systems such as LabView is possible.